Journal of Marketing Management is a double blind peer reviewed international academic journal that publishes scientific research papers on the contemporary practices of marketing. The journal concentrates on the subject of marketing research, from its philosophy, concepts, and theories to its methods, techniques, and applications. The journal is published mainly for technically oriented research analysts, educators, and statisticians. 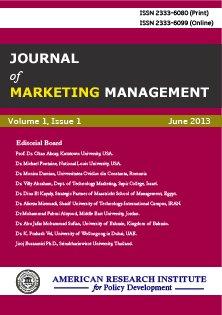 Journal of Marketing Management actively encourages global contributions from scholars across the broad domain of marketing. It welcomes novel and ground-breaking contributions from a wide range of research traditions within marketing, particularly encouraging innovative ideas in conceptual developments and research methodologies. The journal is completely open access which has opened the doors for the millions of international readers and academicians to keep in touch with the latest research findings in the field of economics and development studies. Each paper published in Journal of Marketing Management is assigned a DOI®number, which appears beneath the author's affiliation in the published paper. Click HERE to know what is DOI (Digital Object Identifier)? Click HERE to retrieve Digital Object Identifiers (DOIs) for journal articles, books, and chapters. Dr. Michael Fontaine, National Louis University, USA. Dr. Villy Abraham, Dept. of Technology Marketing, Sapir College, Israel. Dr. Dina El Kayaly, Strategic Partner of Maastricht School of Management, Egypt. Dr Mohammad Fahmi Alzyoud, Middle East University, Jordan. Dr. Abu Jafar Mohammad Sufian, University of Bahrain, Kingdom of Bahrain. Dr. K. Prakash Vel, University of Wollongong in Dubai, UAE. Jiroj Buranasiri Ph.D., Srinakharinwirot University, Thailand.